More Than Gourmet®, the gluten-free friendly sauce and stock company has done it again. They’ve introduced a line of high quality, all natural French sauces that home cooks can use to dress up any meal they want. There are five different kinds and they’re all excellent: Hollandaise, Béarnaise, Dijon Mustard, Lemon Dill, and Roquefort. The consistency and the flavors are as good or better than other sauces I bought in my pre-gluten-free days, and they’re significantly better than anything that might be available to gluten-free home cooks. Indeed, there are excellent gluten-free sauces, stocks and demi-glaces available to professional chefs, but unless you want a huge amount, they’re not available in small enough quantities for home cooks to buy for themselves. 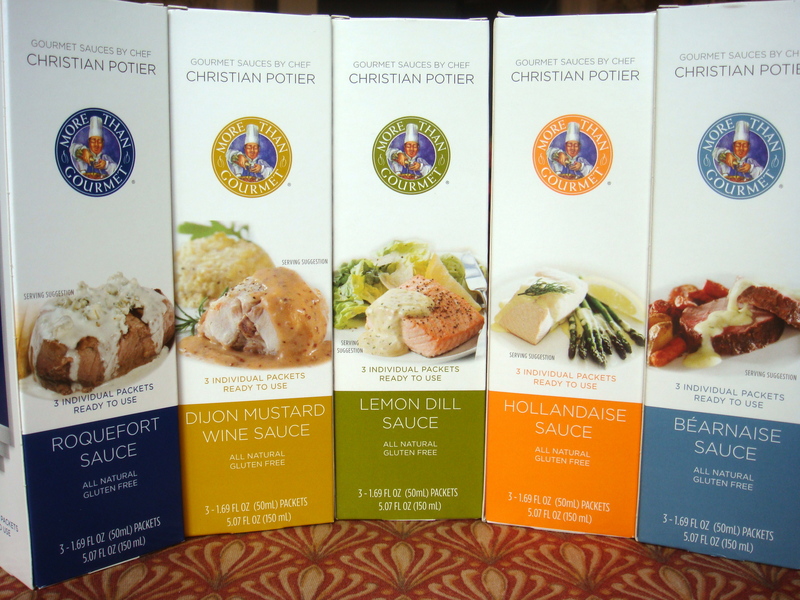 The More Than Gourmet® French sauces come in small pouches, three to a box. Each pouch is ideal for one or two servings, depending on how much sauce you like on your food. In fact, at my house we found that one of the little packets was perfect for two (we always had some leftover sauce when we prepared one per person). To serve them, you can either heat them up in the microwave for a few seconds (in or out of the pouch) or on the stove in a pot of boiling water (in the pouch for 5 minutes). Then you simply cut open the packet and squeeze out the sauce, either into a little bowl for people to help themselves, or directly over the food. The sauces are not inexpensive, but they’re so good and so easy to use that they’re worth the splurge -as long as you aren’t serving a huge crowd around your table (in which case, I’d make the sauce myself). The ability to have perfectly seasoned hollandaise with fresh asparagus – at the last minute – on a weeknight- is really nice for someone like me who wouldn’t typically bother to make it unless I was having people for dinner (and even then, probably not too often). But as I said, these sauces are a treat. I made eggs benedict for the first time in ten years (with the Hollandaise). I probably won’t make it again for another ten, but wow, it sure was fun! I used the Dijon Mustard Wine Sauce on slices of roast lamb for our family. I spooned the classic Béarnaise Sauce on beef tenderloin at a small dinner for friends. I loved the Lemon Dill Sauce on roast salmon and on steamed broccoli. We liked the Roquefort Sauce on potatoes and we’re looking forward to trying it on some other vegetables and perhaps, some meat. All five sauces have a shelf life of several months. And although I haven’t seen them in my local grocery stores, they are available at the More Than Gourmet® website: http://www.morethangourmet.com/. The company also sells a great variety of other really good gluten-free stocks and demi-glaces, including a roasted vegetable demi-glace. Take note though: I am not a huge fan of their Ready-To-Use-Cooking-Stocks. for Eggs Benedict? Can’t wait to try the Lemon Dill when the salmon start running again. I used my English muffin recipe from Gluten-Free baking Classics (and my website: http://www.foodphilosopher.com/assets/docs/090107gluten.cfm). Only issue for you might be the dairy in the sauce. But if you can have the dairy, these are amazingly good. PS. 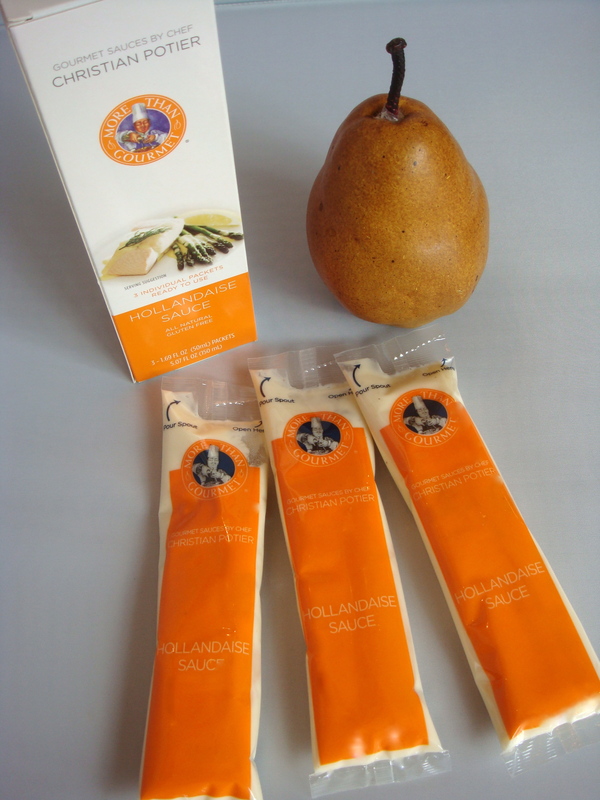 and they have some really good dairy free (and even vegan) demi-glaces on the their website. Thank you so much for sharing your opinions of my work with others. Word of mouth commentary and reviews from real people (and not the paid reviewers or the PR and ad agency social media employees that many companies/publishers hire these days) are what really help give books a long and useful life. And it’s good to hear that the focaccia is popular. I really love that bread, too.